I spent this past weekend out west in Las Vegas. While most people probably don't associate Vegas with birding, there are a few areas close by that offer an opportunity to do just that. 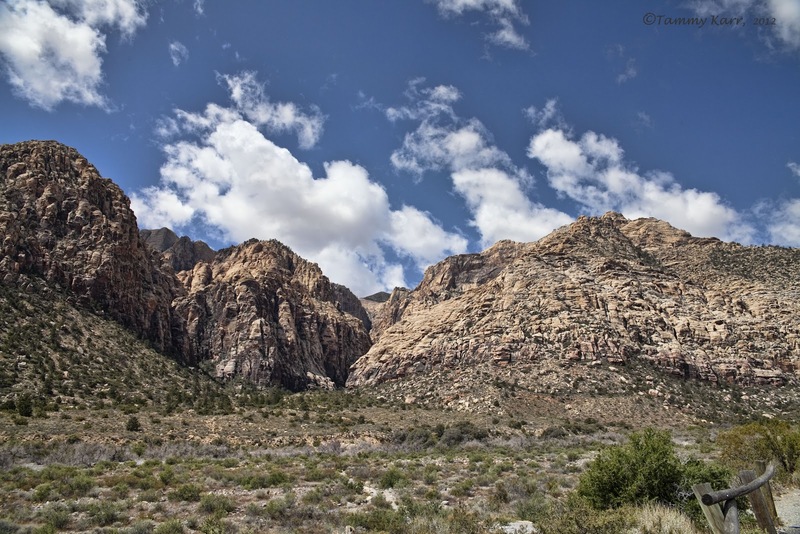 We took a little trip over to Red Rock Canyon National Conservation Area for some combined hiking and birding fun. We explored the scenic drive, a 13-mile loop, which offers lots of eye pleasing scenery, overlooks, and a number of great trails. 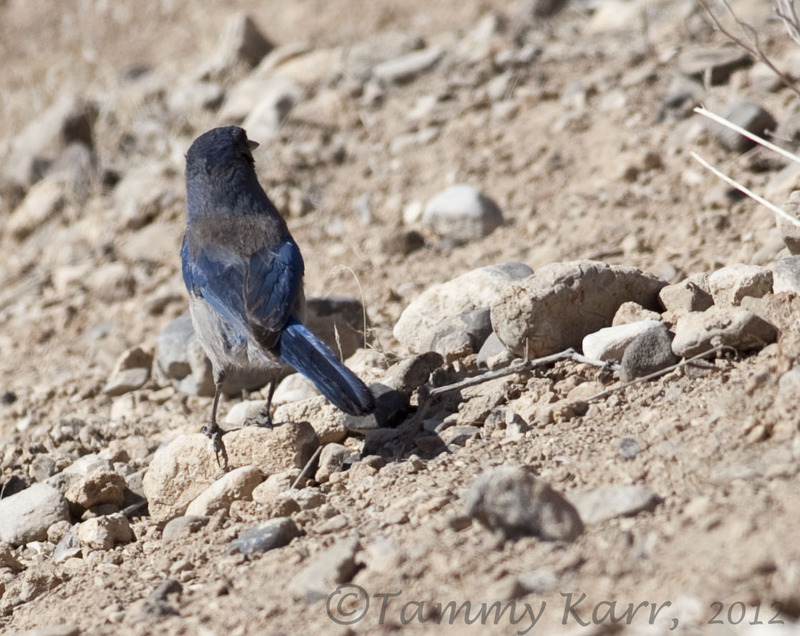 We stopped off at the first trail head, where I saw my first feathered friends, a pair of Western Scrub-Jays. This was my first sighting of the western version of the scrub-jay. They definitely shares the pleasing blue hues with the Florida version! These guys decided to keep giving me the look away. I guess they are a little more standoffish than the jays around home. The trails here at the first pulloff were alittle too steep for the tike so we headed on. We stopped a few miles up the drive at a great little trail that led to a small natural waterfall. There were a number a birds around on this trail. 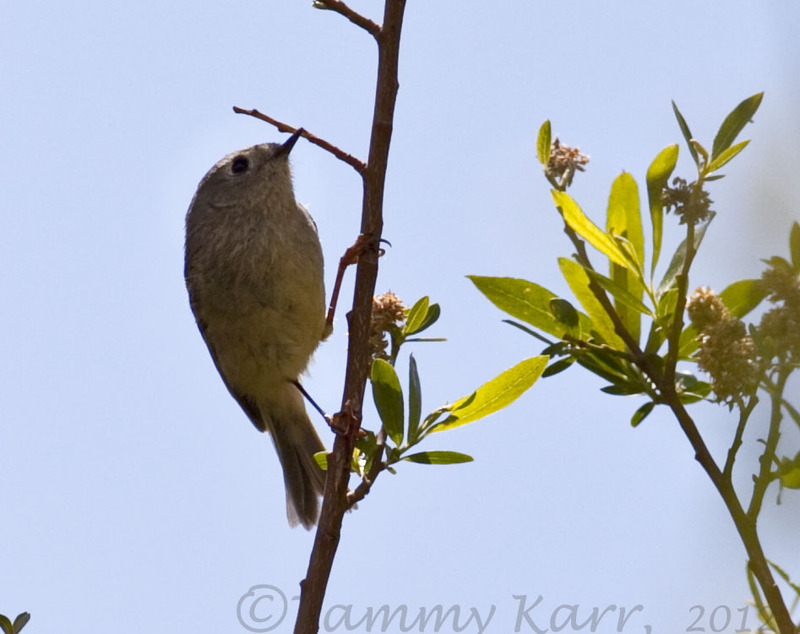 Ruby-crowned Kinglets were abundantly fluttering about the trail, although I couldn't find one on the right side of the trail for some better lighting! I spotted a pair of Sparrows were on the trail up ahead of us as we made our way up, and believe they were Chipping Sparrows, as they were sporting some distinctive rufous caps. Upon arriving at the waterfall, I spotted this guy, which I believe is a Hermit Thrush, a Lincoln's Sparrow (thanks for the id Seagull Steve) perched high up on the rock wall. This was my son's first hike on a trail that contained lots of fun obstacles. He got the hang of it pretty quick! Fun post Tammy. I'll be in Vegas this summer for a conference--good to know there's some birding nearby. Stunning scenery Tammy, the weather looks a lot better than the uk at the moment. Think we are on our 4th day of rain now with another 3 more predicted. I'm back in Florida now, and believe we are slated for rain all weekend too! Sad news! I guess it's difficult to imagine that not so far of a big town like LV there are such beautiful untouched places. Your son sure has had much fun there! Thank you for showing them with your beautiful pictures. Thanks so much for your comments! It is amazing that it is so close to all the commotion! very pretty terrain. definitely different than your viera wetlands! :) cute little boy you have! Great scenery, but not the type that i would associate with birdind. Well, maybe vultures. I guess I have to learn to look harder. There were numerous birds there, not hard to find. Identifying them was more of a challenge.I hoped to see some raptors near the rock walls, but didn't see any. Thank you so much! He is just as sweet as he is cute! He enjoyed the rocks! The 2 times I've been to Vegas, I've stuck to the usual Vegas routine...maybe next time I'll make it outside of the city! Glad you made it west. 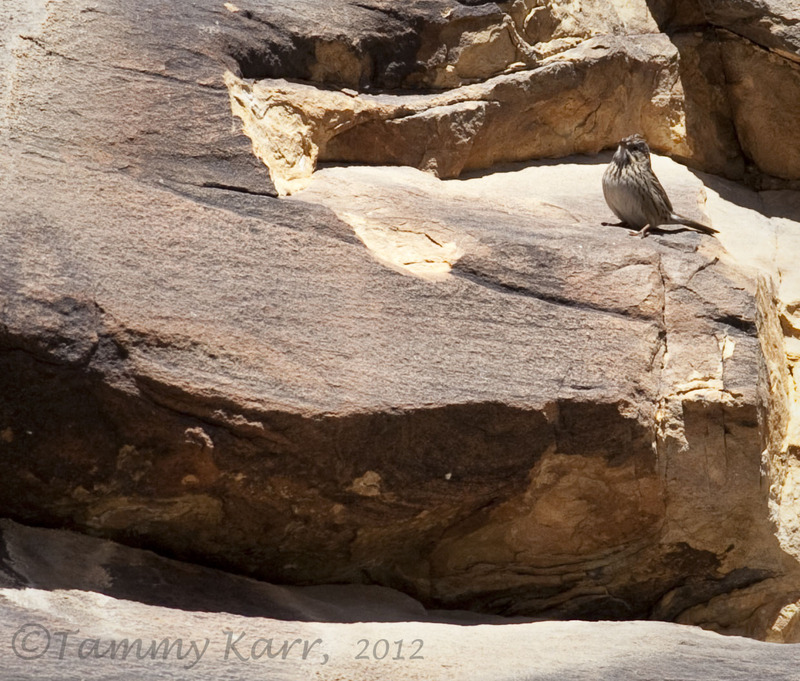 The thrush on the rock is actually a Lincoln's Sparrow (short bill, buffy streaked breast). You certainly may have seen Chippings, but I bet there are Rufous-crowned Sparrows up there as well. It is definitely worth checking out! Thanks for the id; I really wasn't sure what that fellow was; I think I'll brush up on my sparrow skills before my next trip out that way:)I wish I had gotten a photo of the other 2 sparrows! The scenery is gorgeous! 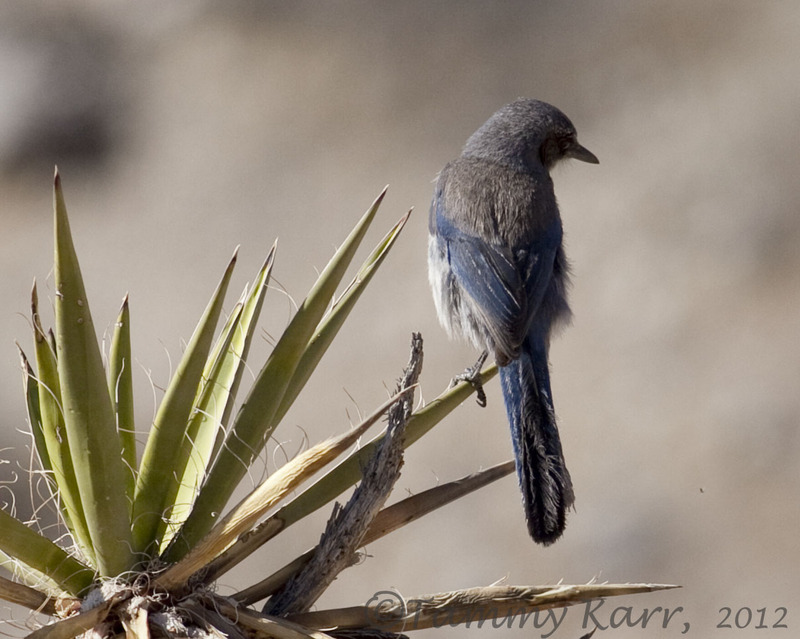 I like the Scrub Jays and how they differ from Blue Jays. It looks like your son was having a great time! You're naughty, (blackjack). 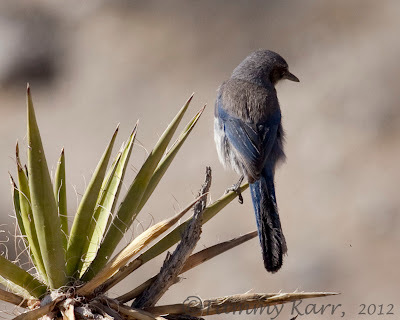 Incredible mountains, Bluejays and the little boy photos. Beautiful. Wonderful images of these mountains. It's mazing to see the beautiful colors of the sky. fantastic!! I meant wonderful, I should take my allergy meds before commenting in the morning! Nice photos. 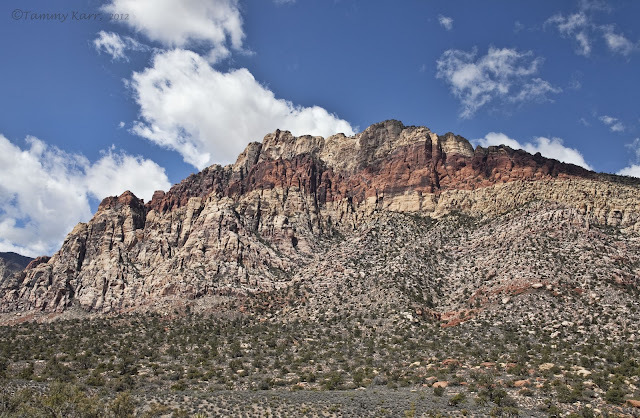 I was at Red Rock last year but didn't come close to any birds -drat! Fabulous scenery and birds Tammy. Loved the shot of the budding rock climber. Preciosos los paisajes rocosos de la primera y ultima foto, y muy buena la composición de la tercera imagen con ese bello pajarito posado en la hoja. Pronto veremos al niño con una camara de fotos detras de las aves. looks like you had a nice trip Tammy, and you found the birds....your little one is sure a cutey...I would rather go birding there than play the slots anyway! 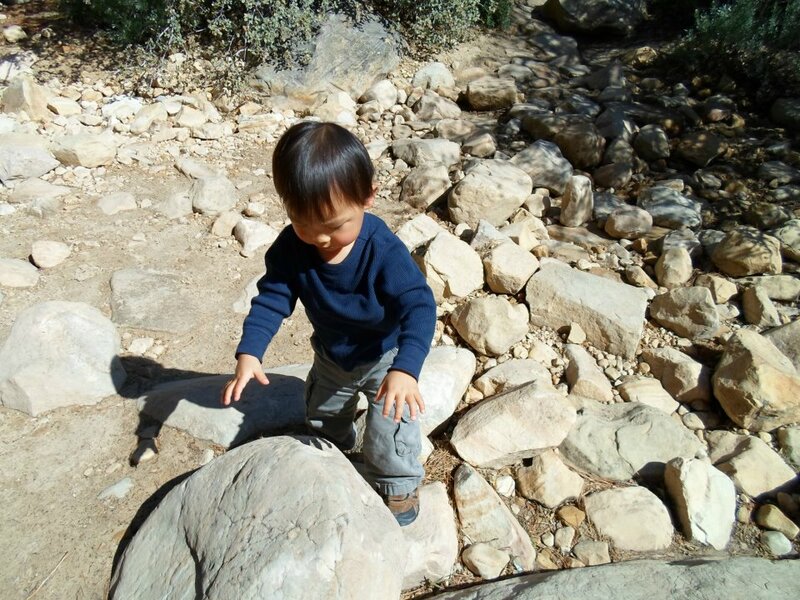 Tammy, your son is adorable as he attempts his first rock climb. It was gorgeous, though, and definitely worth another look! Your photos capture it perfectly. Love the mountain shots with the sky in the background.